ALL In-The-Box is a superset of PDF In-The-Box. So, it offers an object-oriented programming interface, capable of describing and generating documents. This API is supplied with a collection of powerful object classes: Text, Raster Image, Vector Image, Barcode, Table, Band, Cell, Layer, various controls, Note, Attachment, Mediaclip, Signature. To generate a document, you've just to create objects using API methods, give them properties according to your needs then put them on the document. DLL (a 32-bit library for any other programming language). 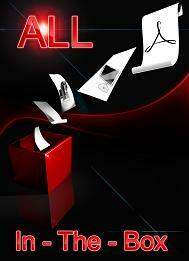 ALL In-The-Box offers a document viewer, to be integrated into your own applications. This viewer has all features needed to give end-users full control over document navigation (tool bar, zoom, thumbnails, bookmarks, search engine, notes, attachments...). ALL In-The-Box can also print documents with full control over printing features (printer and paper tray selection, print quality, collate mode, duplex mode, color mode, copies, shrink to margins...). ALL In-The-Box can save the generated documents to its own proprietary format in order to subsequently reload them for editing, displaying or outputting purposes. Warning! ALL In-The-Box can't load PDF files, it can load its own format only. So, the reloading and editing features are reserved for self-generated documents. « Some months ago I asked Synactis if they could create a component that would produce both PDF files and also be able to directly print to a selected printer without the need to call the Adobe API.